Diverticular Disease (Diverticulosis and Diverticulitis) - What is it? Diveticula are herniations or protrusions that out-pouch from the inner lining of the colon. They are sort of blow outs from the inside out. The pouches form between the outer muscular layer and the arteries and veins which fill the outer wall of the colon. Colon Diverticula are usually about the size of a pea but vary in diameter from a few millimetres to several centimetres. Diverticula most often form in the lower left side (your left) of the colon. They can form on the other side (the ascending colon) but this is not common, When diverticula are present the condition is known as Diverticulosis. When the diverticulum become inflamed the condition is known as diverticulitis. If you are curious to see a colonoscopy showing divertiucla then visit Youtube and watch the video by Dr Hiromi Shinya. If you live nearby I can supply you with Kangen Water or if not then investing in a Kangen Water Machine is definitely worthwhile. Have a look at the section on Kangen Water on this site. Lack of dietary fibre and irregular bowel habits play a major role. Diverticular disease is practically non-existant in groups of people who eat a high fibre diet. A diet rich in fruit, vegetables and whole grains is abundant in fibre but most people's diet in the UK is low on all three. A low fibre diet will disrupt normal motility (movement of waste through the colon). Dehydration is also a significant factor causing dry hard stools which are hard to pass. In countries where people continue to use a squat position to evacuate their bowels diverticular disease is much less common. A squat position straightens up the rectal passage and the pressure from the thighs on the abdomen facilitate much more efficient emptying of your bowels. Sitting correctly is one of the simplest things you can do to improve bowel health. What Are The Signs and Symptoms of Diverticular Disease? What Are The Signs & Sympotoms of Diverticulitis? Whilst someone with diverticular disease may be completely unaware they have the condition those who have advanced toi diverticulitis will be painfully aware. How Serious Can Diverticulitis Be? Serious complications with diverticulitis can lead to bowel obstruction or perforation. With obstruction toxic waste is prevented from leaving the body. With a perforation, a tear or hole develops in the wall of the colon allowing bacteria and waste materials to spill out into other areas of the body. In most cases if a perforation occurs the body will limit the damage by forming a boil or abscess. If inflamation does not seal the body then bacteria from the colon can get into the chest cavity and the person runs the risk of developing peritonitis. If the infection gets into the bloodstream then septaceamia can develop with potentially life threatening consequences. Infection can also travel to other parts of the body via fistulas which are passage ways opened up by the infection which can pass between organs or between and organ and the skin. Fistulas most commonly form between the colon and bladder creating infections there. A fistula is a serious medical problem and will usually require surgical intervention. When diverticula are found, and there is no inflammation present, generally no treatment is undertaken although the patient may be given advice about diet and a preventative measure. There is no way to get rid of diverticula once they have formed but steps can be taken to ensure they do not become inflamed and that more pockets donot develop. During an episode of diverticulitis (when the pockets become inflamed) two steps are generally taken to treat the condition: gie the colon a rest and treat the infection. Colon rest is achieved by sticking to a liquid diet (patients in a severe condition may be given fluid intravenously until the flare up calms down) and antibiotics. In the most serious cases, surgicalintervention may be required to remove the affected portion of the bowel. Although diverticulitis is a serious condition it does not predispose a person to bowel cancer or even to precancerous polyps. Obviously if you think you may be suffering from diverticulitis then you need to see a doctor asap. The following information is intended to help you manage your diverticula and protect against further development of the disease. Hydrate: Dehydration slows transit times of waste, impairs digestion, makes for dry, hard, difficult to pass stools and impairs every function and process in your body. You need at least two litres of water per day, more for larger people and for those with a considerable hydration debt. Read the section on Rehydration for more information. Improve digestion by drinking one pint of warm water half an hour before each meal and do not drink any liquids for one hour after a light meal and two hours after something heavier. Drinking liquid with food dilutes your stomach acid and impairs digestion. Chew: as a nation we British appear to have given up chewing. Maybe its because everyone is in such a rush all the time. Chew everything thirty times. By the time food leaves your mouth it should have the consistency of mashed potatoes. As you start to become more aware of your chewing you will notice how quickly your swallow response is triggered. Cook: Cook whole grains in twice as much water and for twice as long as you normally would. Eat: Lashings of fruit and vegetables, oily fish at least three times per week, soups and stews, soft foods such as vegetables mashes, soups, rice pudding (made with brown rice), good quality tender meat, eggs, quality raw oils (for salad dressings and pouring over vegetables). Nuts & Seeds: Soak all nuts and seeds before use and grind in a blender or coffee grinder. Multi-grain Bread: Whilst this should be beneficial owing to the added dietary fibre, few bakers bother to crack the grains rendering them totally undigestable. Whole seeds careering through your system are just asking for trouble. Ryvitas: Again something people tend to think of as being beneficial. During colonics I can always spot a Ryvita Eater - they are full of undigested tiny hard black seeds, again just waiting to get lodged in a diverticula. Chew Deglycyrrhizinated liquorice on an empty stomach - helps to soothe and heal the colon. It is most often abbreviated as DGL. I have not been able to find a satisfactory supplier but you will find it on the net. Drink five ounces of Aloe Vera Juice twice per day. Take 5 to 10,000 mg of L-Glutamine per day on an empty tummy, in warm water, last thing at night for thirty days and repeat this at least twice per year. L-Glutamine is used by the intestines to regenerate the intestines. Digest Take Well Digested digestive enzymes before and after every meal. Fibre Taking a fibre supplement really makes sense. You need at least 35g of fibre per day. There are many options on the market many of which are a complete waste of time. The best I have found is Go Daily. 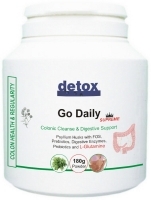 Go Daily contains psyllium husk which absorbs 25 times its own weight in water creating a soft, gel-like sponge which will sweep clean the colon as it passes through giving a spring clean every day and will help to keep the diverticula free of potentially problematic debris. Go Daily contains both soluble and insoluble fibre and is the perfect fibre solution. Go Daily also contains Digestive Enzymes, 8 strains of probiotic cultures, prebiotics and L-Glutamine. It is the ideal product for long-term daily use and there are no downsides. Essential Fatty Acids (EFAs) In addition to eating oily fish in your diet it is a good idea to supplement on a daily basis. EFAs lubricate the digestive tract, and help to reduce inflammation. Probiotics All bowels benefit from the periodic introduction of beneficial bowel bacteria. You need a broad spectrum strain with 2 to 6 billion live bacteria. Beneficial Bacteria contains 8 strains with a guaranteed 4 billion live bacteria per capsule and PrioBiotic Max contains the same eight strains but with 20 billion live bacteria..
Antioxidants Take a good quality antioxidant forula. My favourite is AntiOxidant Dupreme which has been clinically tested and shown to be anti-aging, contains 22 fruits and vegetables, is highly bio-available and easily digested. Brilliant for promoting healing. Colon Hydrotherapy: Make colonics a regular part of your health and wellness regime. Initially have 3 to 6 sessions to clear the bowel of stagnant waste and remove debris around the diverticula. Then have a monthly session. Regular colonics will help prevent diverticular disease turning into diverticulitis. Diverticulitis is a contraindication for colon hydrotherapy so you cannot have colonics when the condition is in its inflamed mode. Yoga: Very beneficial in that it improves core strength. Stronger abdominal walls generally mean a better supported and therefore more efficient colon. Acupuncture: Can be very effective at balancing energies and aiding with the restoration of efficient bowel function. Massage: Stress seriously impairs your digestion so massage can help you to relax and unwind. Meditation: Again a great stress buster - myriad benefits for bowel health and overall wellbeing.